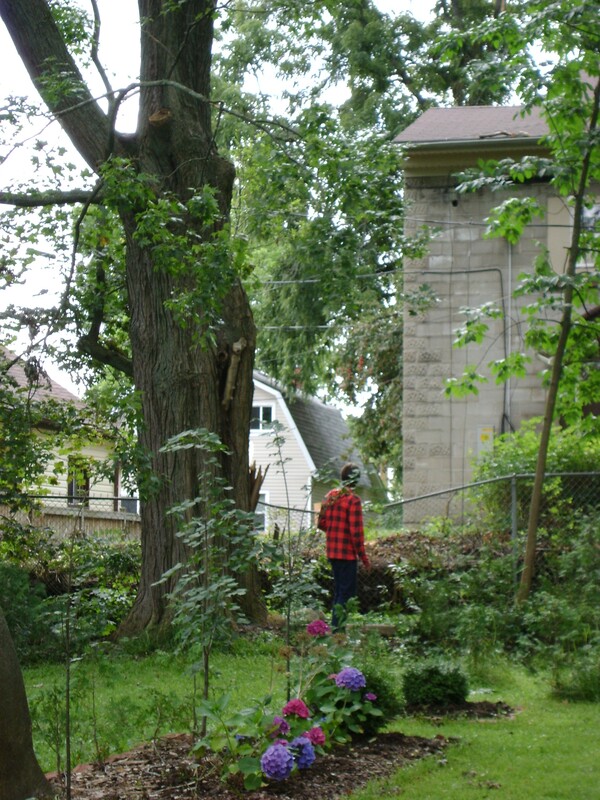 I was reading Helen at Toronto Gardens post the other day about her 150 year old sugar maple that came down at her cottage in Quebec. We do not know how old ours is. We had it pruned and checked two years ago, and the tree guy said it is old, but that it will last. Will it didn’t! One third came down, 2 weeks ago during a particularly heavy wind which only lasted for 15 minutes. It is about 5 feet from the property line and crashed down on our neighbours metal garden shed, crumpling it like a tin can. Luckily it fell between the two houses, so there was minimal damage, except to our hearts. That was our favourite tree. We didn’t know how old it was, but I am sure older then our 130 year old house. It gave us so much privacy as well, which we didn’t realize. When it came down it broke about 4 young trees. Now we have a gaping hole. 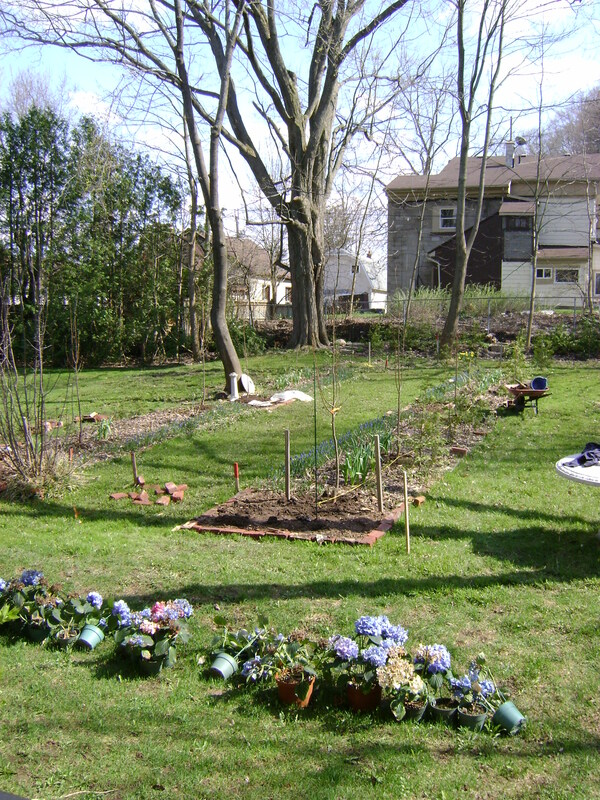 I could only find pictures that were taken for other reasons in the garden, and the maple is only an afterthought in the corner, but please take a look at these. There it stands, proud in early May. Not yet leafed out, you can see that the top is divided into three sections. The back one is semi hidden behind the middle. Now leafed out in late May, you can see how much privacy it gave us. There is also three young trees around it and a bit of shrubbery on the neighbours side of the fence. 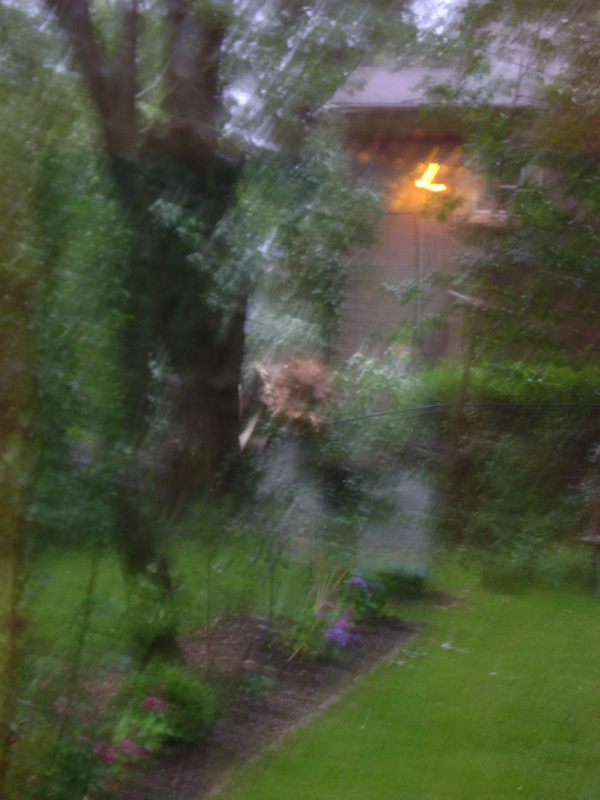 Now, obviously this picture was not taken to focus on the maple, but you can hardly see through that corner. Oh the agony! I couldn’t bring myself to get any closer to the carnage. The maple, bent the metal chain link fence, and broke the saplings and shrubbery around it in its dying throes. I was to heartsick to go to the viewing, so stood on the other side and using the zoom, made my husband go over so you could get a sense of how large this tree is. (we never saw that house with the barn roof before, obviously, it wasn’t just built.) It will take a long time to fill that empty hole. 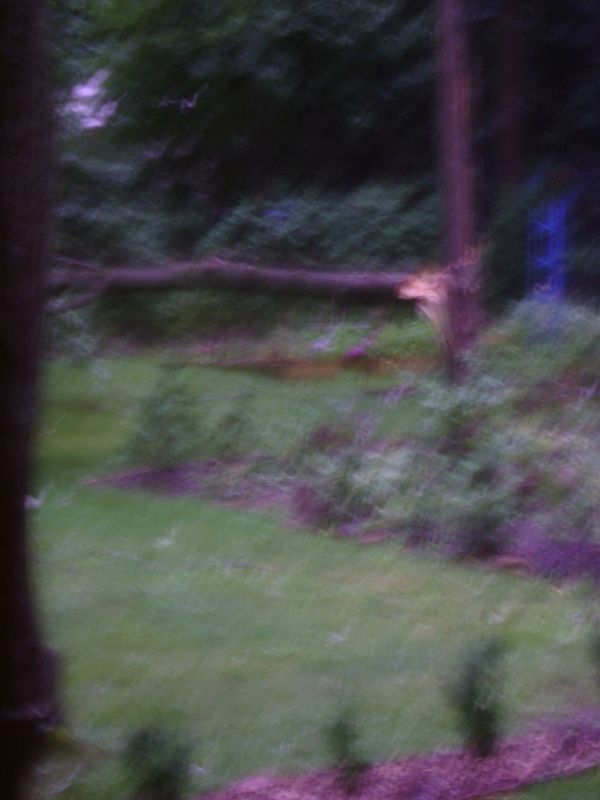 This was the smaller of the two trees that fell. Our trees seem to grow very tall and skinny(too bad I didn’t). 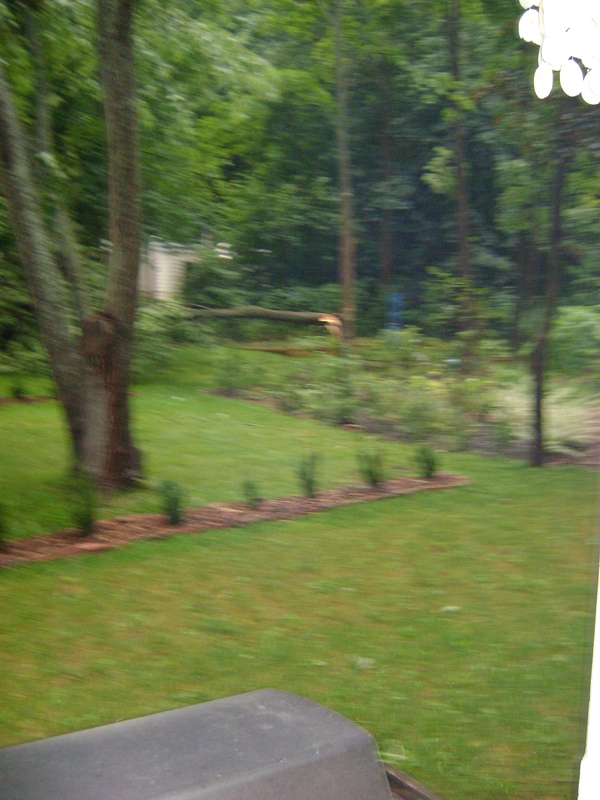 However, this fell only on our property and actually hit another tree, you can see how the tip is just bending up. It is hard to believe by looking at this picture, but that tree is taking up aprox 1/3 of the depth of our property. We have a depth of 150 feet. After I put in this picture, I realized that it might be hard to visualize how large the tree actually is. So I put a picture of Ian in. 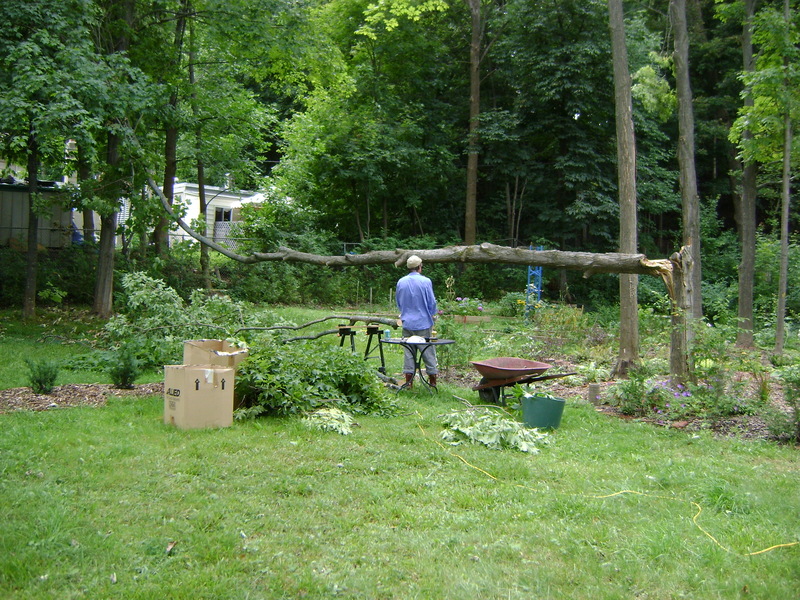 This one was easy to cut up, even with our 14″ electric chainsaw (boy, those things scare me). Last week, Helen at Toronto Gardens commented on a post of mine, and mentioned that the Humidex was going to be over 40 that weekend. I responded with the fact that it is cooler in Owen Sound and there is “lots of breeze off Georgian Bay”. Well, I found out to my cost that there is. Sunday night, at around 7 p.m., the “breeze” started. It got heavier and heavier. Winds reached up to 96 kilometers an hour at Pearson airport, but I swear, they were worse in Owen Sound. Hydro One reported that Owen Sound, as well as Guelph and Newmarket were hit particularly hard. I know Kilbourne Grove was hit particularly hard. Ian and I had just been congratulating ourselves on all the large old trees on the property. 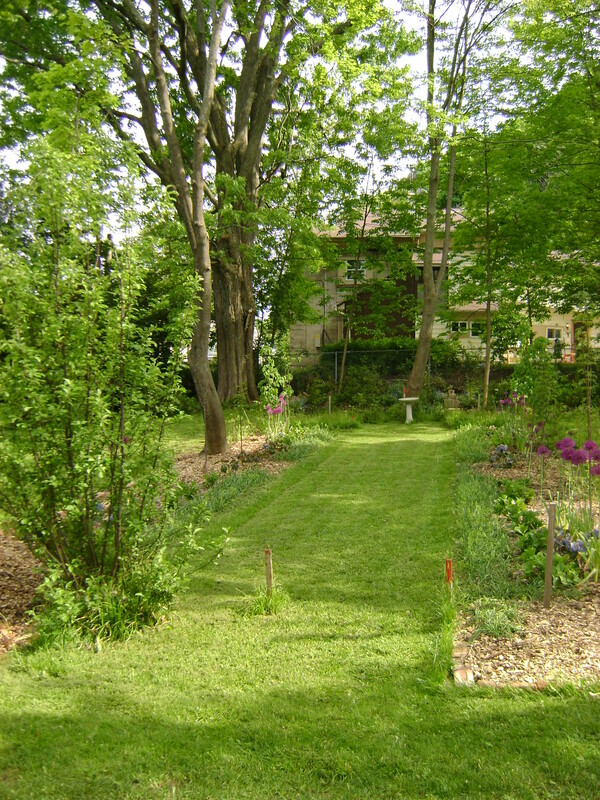 We counted 10, just in the middle of the garden, but there is many, many more on the boundaries of the property. It makes such a huge difference in the temperature of the house when it is hot and sunny outside. 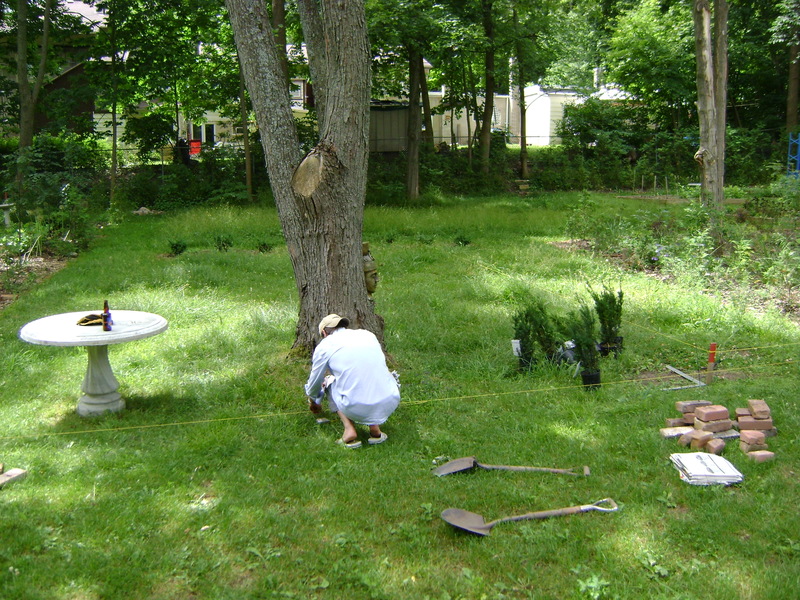 The smaller tree is not a problem, it fell on our property and I have not planted anything in that area, so it can wait. 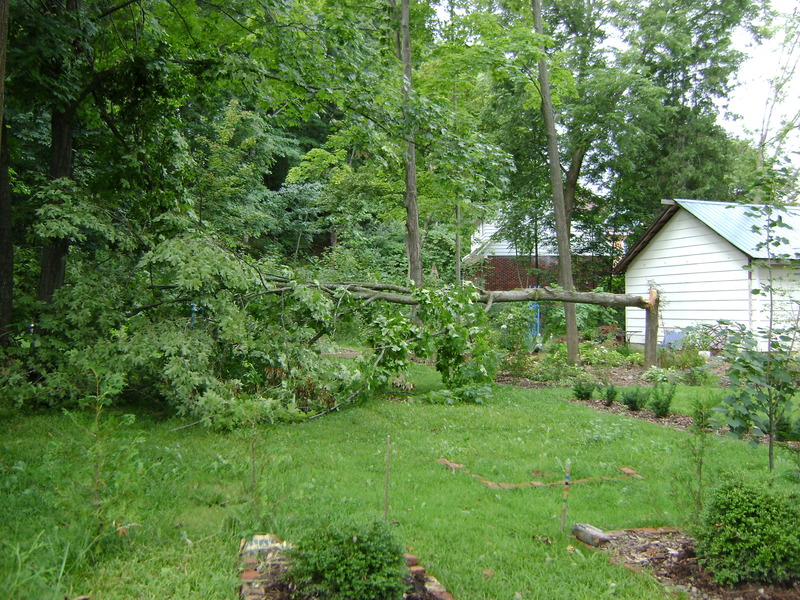 However, the larger tree was about 4 feet from the property line fell onto the neighbour behind us, it cannot wait. It is very difficult to get someone to respond to phone calls, I am sure that the tree services in Owen Sound are very busy, we are not the only people to have problems, (unfortunately for our neighbours). We are not sure if there is damage to the house, until the tree comes out, so we are up in the air for now. Cross your fingers. I was just reading Yvonne Cunnington’s blog over at the Country Gardener and she has posted the Agriculture Canada map of Ontario’s precipitation for April 1-July 30, 2009. Owen Sound is in the very high area. Now, I already knew this as every weekend that my husband and I visited our house, it was either raining, had just rained, or was to rain the next day. As it takes me four hours to cut the grass, never mind the edging, there became a problem. I never had a four hour window of time. 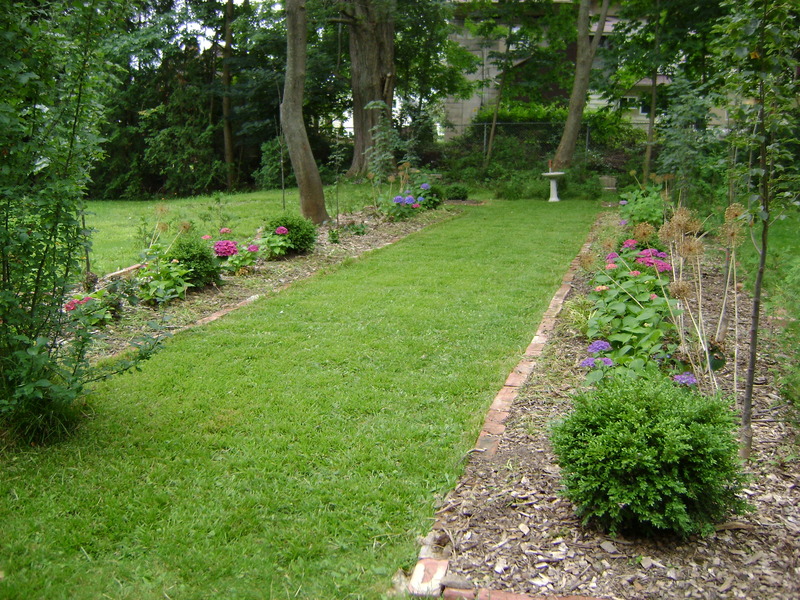 Consequently, I was only able to get around the house cut on a consistent basis (so the neighbours won’t run us out of town) and the “back 40” didn’t get cut. This went on all summer, until our holidays two weeks ago. By this time, farmers had already cut for hay, and my hay field (as it was now), could have competed with the best of them. I had to angle the lawn mower up on its back wheels, and slowly lower the front over the thigh high grass. I certainly didn’t take any pictures of this deliberately, but I noticed that in the background of Ian planting the yew hedge, that you can see it, and this was two rain filled weeks before I cut it. My mother in law wants me to hire a neighbourhood kid to cut it while we are gone all week, but having been a kid myself, I don’t think that I can find one willing to spend 4 hours, not to mention being careful, not to drive over any of my “precious”. As long as the neighbours don’t take up a petition to evict us from the “hood, we will continue the way we have. And just hope next year, isn’t as rainy!